Hey everyone! 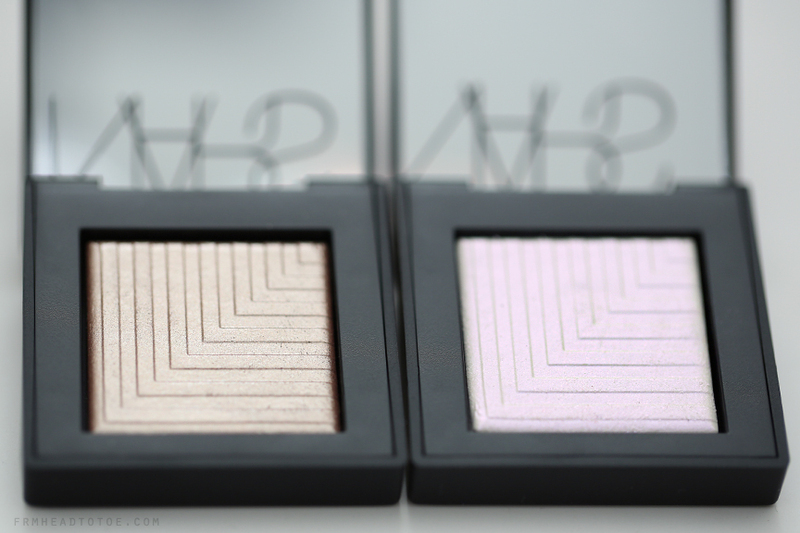 Today I wanted to share a review of the brand new Dual Intensity Eyeshadows from NARS. This is a fresh formula which is particularly special because you can use it dry for a traditional eyeshadow experience or add a drop of water to up the ante and make it even more opaque and dramatic. NARS says these shadows have a sheer, luminous finish when applied dry but I was really interested to see if the performance was smooth and usable even if I didn't want to use it wet. The dry-to-wet formulas I've tested in the past have been less than impressive so I really wanted to see if this would change my perception. Lets check out Himalia and Cassiopeia below! Himalia is a really beautiful, velvety taupe with a bit of metallic sheen which especially shines when wet. 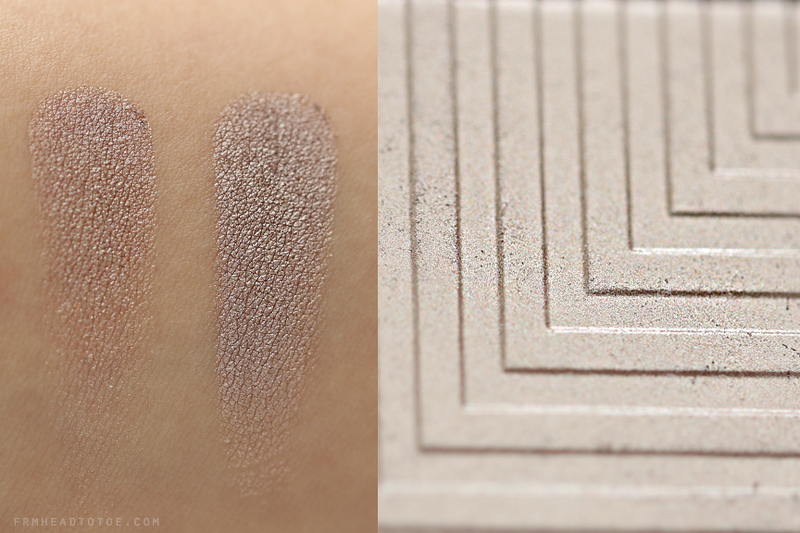 I was actually pleasantly surprised at how smooth and nicely it applied dry, just like other typical high quality eyeshadows, but adding water turns it into a lovely cream texture which adds to the opacity and metallic quality of this shade. 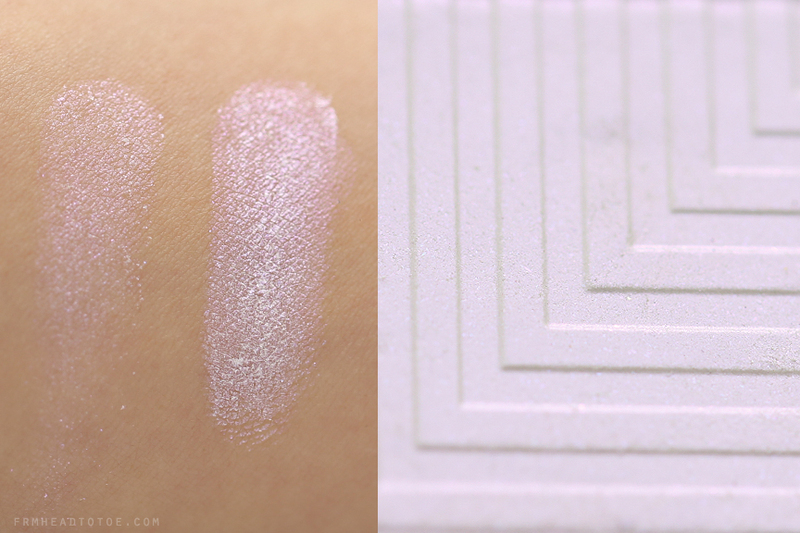 Cassiopeia is a reflective white-pink which has more of that sheerer finish I expected from NARS' product description. The shadow is still high quality dry but you definitely see it in its full potential when used wet and has a much bigger dry-to-wet difference compared to Himalia. The awesome thing is that usually with this type of iridescent shadow (which I am a huuuuge sucker for) is that you often need a great base to have the iridescent color really pop, but with this all you need is water. 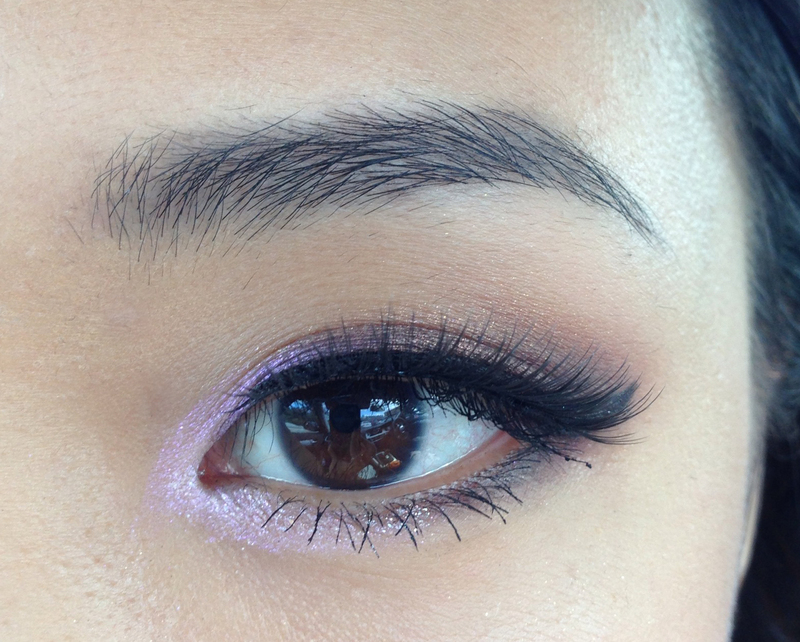 When I used this wet on my lids and inner corners, the pink shimmer was definitely squeal-worthy! 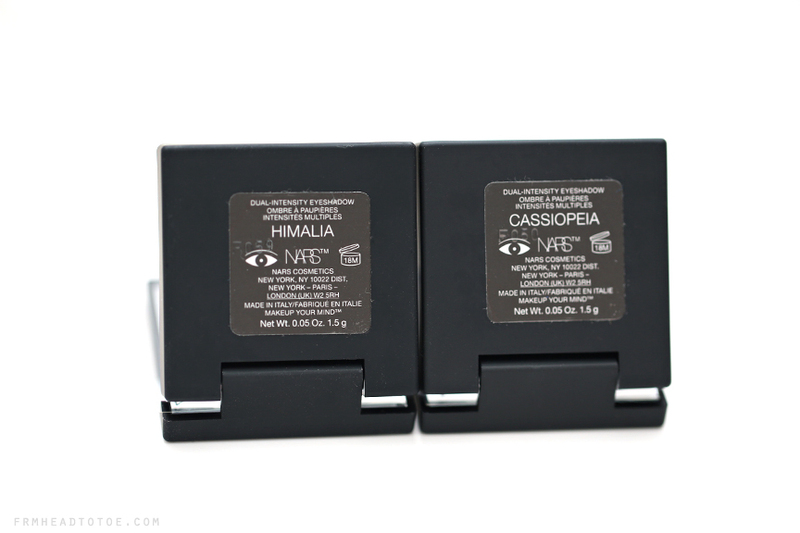 If you are interested in picking up the Dual-Intensity Eyeshadows, you can find them for $29 beginning July 1 at NARS boutiques and NARScosmetics.com. 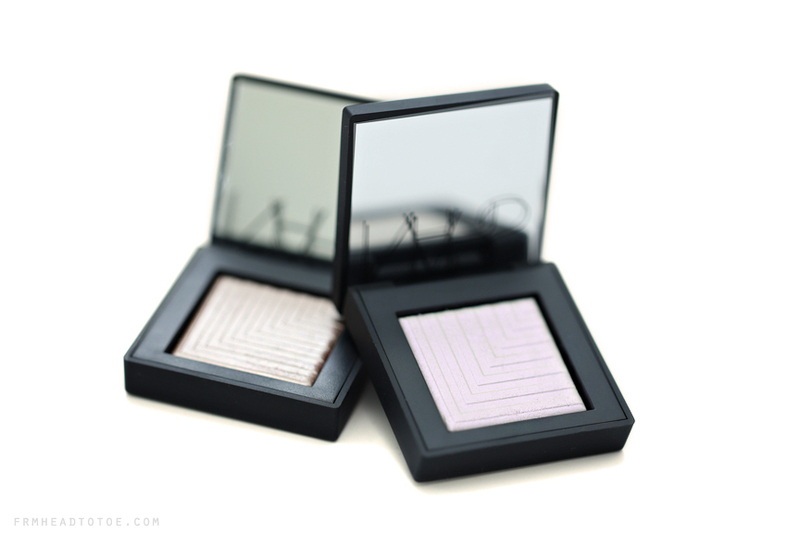 Readers, will you be picking up a Dual-Intensity shadow? Have you tried dry-to-wet eyeshadows before? What did you think of it? Let me know in the comments! Disclaimer: This post contains product provided by the company's PR for consideration. For more information please see my review policy. The only dry-to-wet eye shadows I've tried have been from Avon and they were great wet, but essentially useless dry. When you used water with them they'd get thick and creamy and stay all day (this was before I discovered my holy grail Urban Decay eye primer) but when you used them dry none of the color would show up. I never though to try them again until this review! I'm really loving the Cassiopeia and will definitely look into getting one for myself! I love that Himalia color! Cassiopeia looks gorgeous wet! Will you be getting and reviewing Andromeda, Jen? The swatches look beautiful! The colours look even more gorgeous when applied wet! It looks wonderful on your eye! Honestly the swatches doesn't look that impressive... do you think they are worth the money? I adore the Cassiopeia one it looks stunning on you! I saw these in your favorites video! I'm always a sucker for eye-catching iridescent eyeshadows. love the himalia one ! I like the way they look wet and i think it is a great idea for the summer looks.